A New York-based Guyanese metropolitan bus driver, who was crippled as a result of a gunshot injury at Parfaite Harmonie, West Bank Demerara almost two years ago, was found stabbed to death in his Brooklyn apartment. 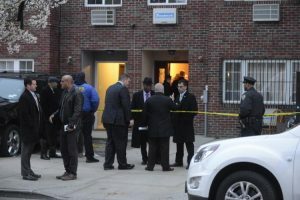 The New York Post reported that Otis James, 48, was discovered unconscious and bleeding — with stab wounds to his head, face, chest and torso — inside his home on Central Avenue near Cornelia Street in Bushwick at 4:30 p.m. Tuesday, cops said. His apartment may have been ransacked, police sources said. The Post also reported that a woman who lives with James made the gruesome discovery, and ran to tell a neighbor, who called 911, police sources said. Paramedics pronounced James dead at the scene. James worked as a city bus driver from 2005 to May 2017, when he retired on disability, according to an MTA source. “This is tragic news and our thoughts and prayers are with Mr. James’s family,” MTA president Andy Byford said in a statement. James had been shot to the left side of his chest at point-blank range on May 18, 2016 outside a friend’s home after he had closed the gate to board a car that he had expected to pick him up. Otis’ aunt, Donna James, said her nephew grew up in Guyana and came to New York at a young age. “I was home when I heard the news … my daughter — his cousin — she just told me she got a message,” James said. “She didn’t really say if he was dead, someone just [called] her and [told] her that something happened in the home,” the New York Post quoted her as saying. James left behind a wife and two children, his aunt said. A knife was recovered at the scene, police sources said. No one was in custody by Wednesday afternoon, and the motive remained unclear.